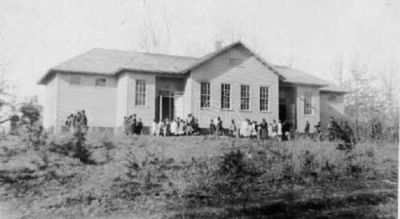 The Julius Rosenwald Fund schools were built across the South beginning in 1912 with money donated from businessman and philanthropist Julius Rosenwald. Although the first schoolhouses were completed in 1912, the Rosenwald Fund was officially established in 1917 and was used primarily to fund projects to enhance education for blacks, especially in the South. Julius Rosenwald (1862-1932) was a multimillionaire Jewish merchant and one of the founders of Sears, Roebuck, and Company, then the largest department store in the United States. Rosenwald was a friend and admirer of Booker T. Washington and at the time a member of the Tuskegee Institute Board of Trustees. In 1911, however, after reading Washington’s autobiography, Up From Slavery, he persuaded other wealthy white philanthropists to join him in setting aside a portion of the funds they donated to Tuskegee to be used to build black schools in rural Alabama. Rosenwald held education in high regard and considered it the key to African American progress. He also observed that support for black educational opportunities in the South was compromised by the racial policies of white supremacy. Rosenwald determined to support black education through Alabama at first and eventually across the entire region by providing funds for the construction of rural schools and for teacher salaries and school supplies. Rosenwald also stipulated that the support would last for thirty years only. After that point local organizations were to assume support for these schools. Booker T. Washington persuaded Rosenwald to extend his support to allow for the construction of houses for teachers in rural communities. The first two schools supported by the Rosenwald Fund were built near Tuskegee. The Rosenwald Fund school project faced criticism from white Southerners who were irritated that black schools should receive support over white schools. Southern school boards and state systems of education routinely underfunded African American schools while allocating more funds for the education of white students. Many white Southerners considered providing any education for blacks as troublesome and unnecessary. Rosenwald felt otherwise, and maintained the firm belief that black self-help was as important as the donation of monetary resources by outsiders. Black communities raised millions of dollars in the two decades that the schools were built. By 1928, one in every five black schools in the South had been constructed using aid from the Rosenwald Fund and by 1932 Rosenwald Fund schools accommodated a third of the Southern black school population across fifteen states. When the program ceased in 1932, over 5,300 schools, homes, and shops had been constructed. North Carolina had the largest number of Rosenwald Fund schools with a total of 787. The Rosenwald Fund donated to a number of other projects including the work of the National Urban League and the National Association for the Advancement of Colored People (NAACP). On July 30, 1948, the Julius Rosenwald Fund dissolved after twenty-five years of existence. Some Rosenwald Fund schools still stand across the South today and remain in use as community centers and registered historic sites.